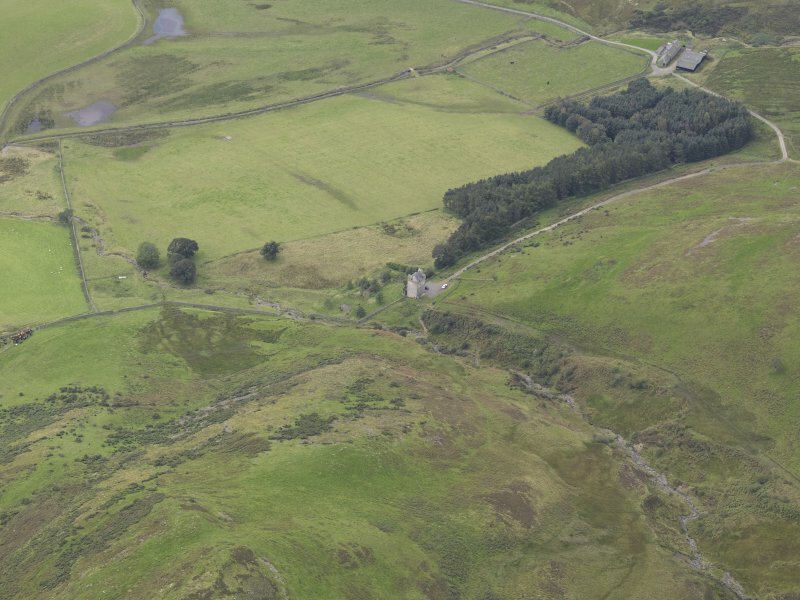 Oblique aerial view of Kirkhope Tower, taken from the SW.
General oblique aerial view looking across the tower-house towards the village, taken from the NW. 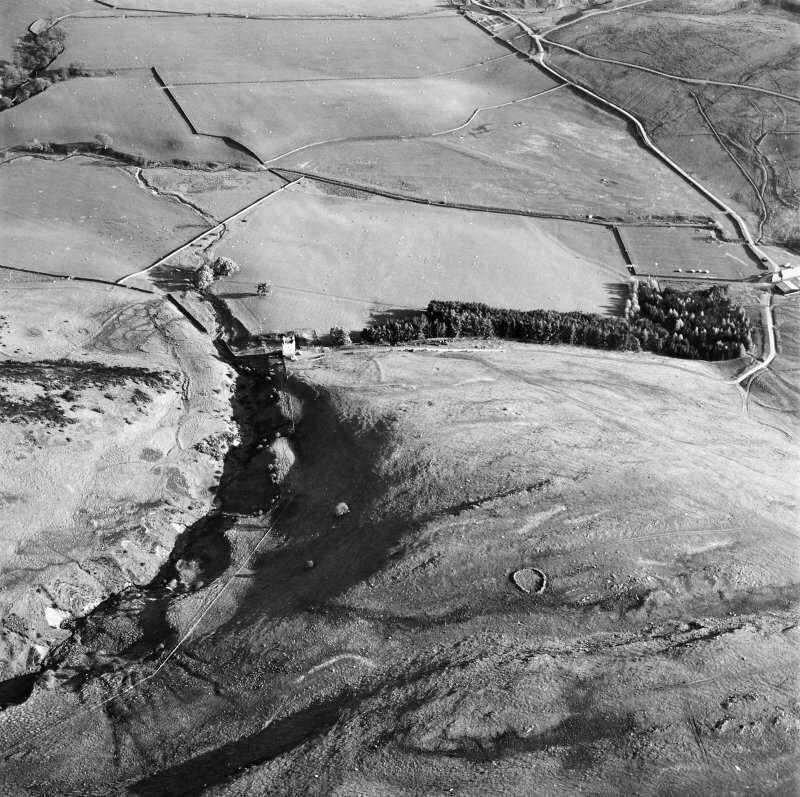 Oblique aerial view centred on the remains of the tower with the field system and tower adjacent, taken from the NE. Oblique aerial view centred on the remains of the tower with the field system and tower adjacent, taken from the NNW. 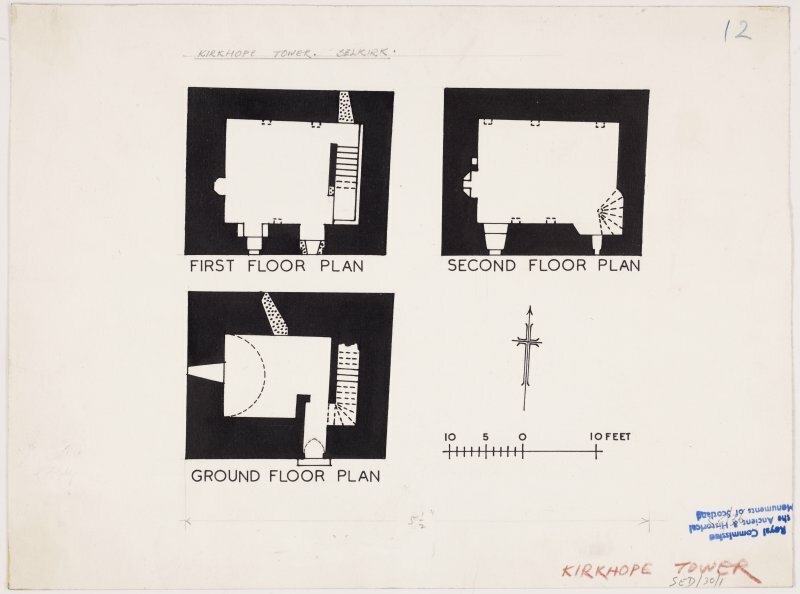 Publication plan of ground, first and second floors, Kirkhope Tower. 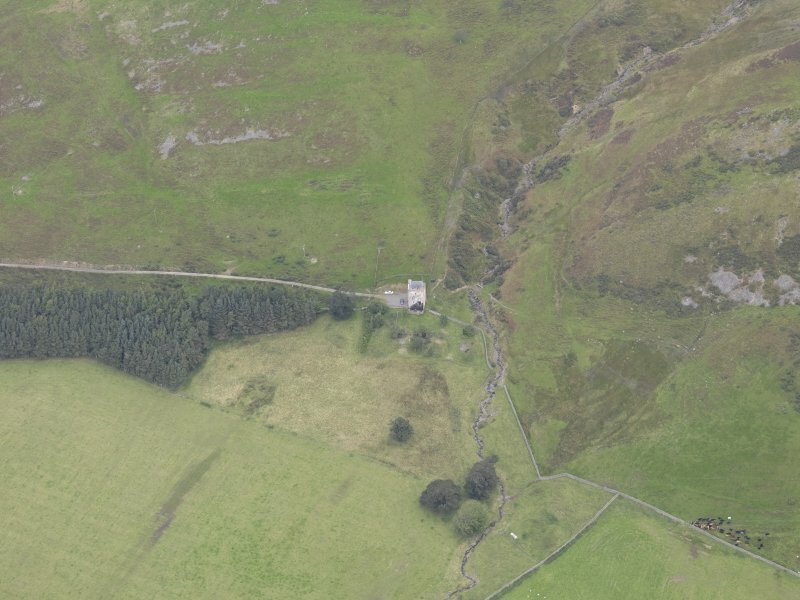 Oblique aerial view of Kirkhope Tower, taken from the S.
Oblique aerial view of Kirkhope Tower, taken from the NW. 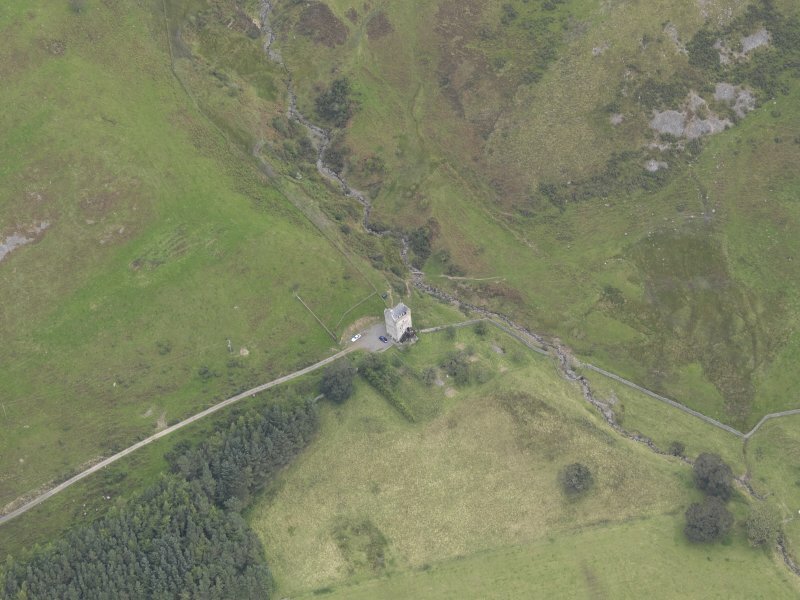 Oblique aerial view of Kirkhope Tower, taken from the SSE. 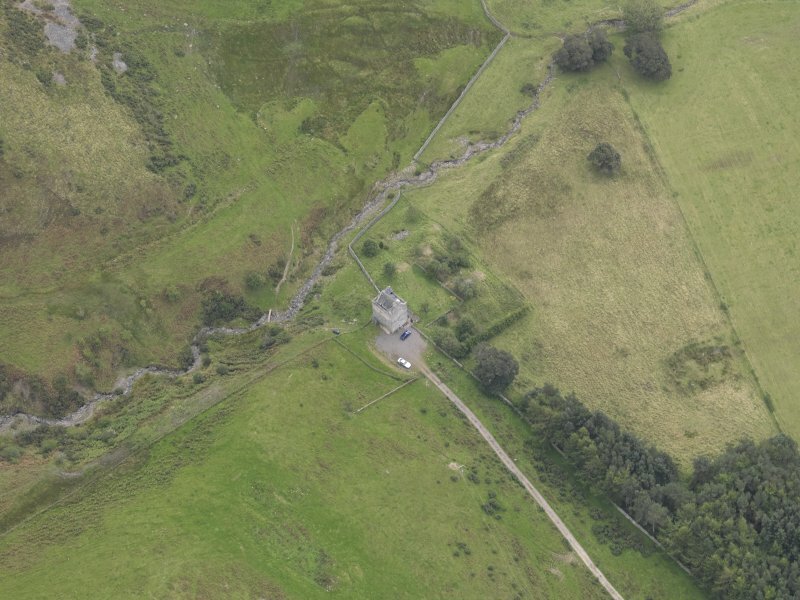 Oblique aerial view of Kirkhope Tower, taken from the NE. 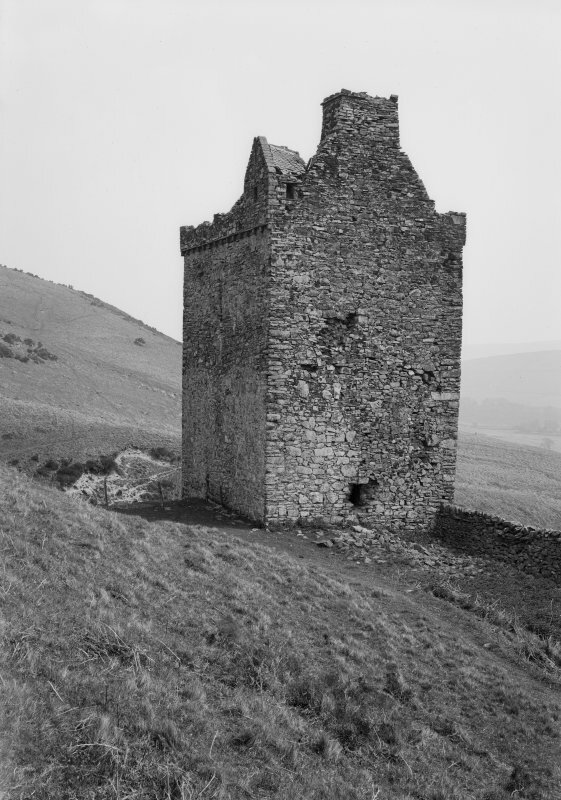 Kirkhope Tower. From an elevation of 800 ft. O.D. 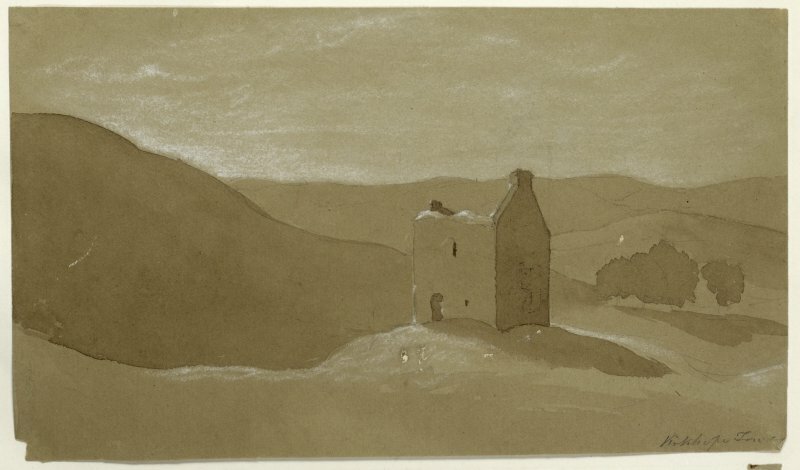 on the broken S slope of Tower Hill, this strong little building looks up the valley of the Ettrick Water and across the Tower Burn to the river-crossing at Ettrickbridge End, three-quarters of a mile to the SE. It is embodied in the N wall of a small rectangular barmkin, the existing wall of which may be of no great age. The barmkin measures about 45 ft. from N to S by 90 ft. from E to W and contains fragments of outbuildings on the W and S sides as well as in the NE corner. The entrance to the barmkin is situated between this corner and the tower, and the tower can only be entered from the barmkin. The tower itself, four storeys and a garret in height, is oblong on plan, measuring 22 ft. 10 in. from N to S by 27 ft. 9 in. from E to W. Except at a cap-house over the SE corner, the fabric is roofless, but otherwise it is almost intact. The masonry is of uncovered whin-rubble, in which freestone dressings are sparingly used. There is an entire absence of gun-loops. On three sides of the building there is a parapet walk at the wall-head, set out on rough whin corbelling; cap-houses surmount the NW and SE corners, the one to the SE covering the stair-head. On the W gable, where there is a massive chimney-stack, the parapet walk is omitted. The gables have tabled skews instead of crow-steps. There are two entrances, both in the S wall, situated one above the other at the ground and first-floor levels respectively. The lower one, unaltered, has provision for a single door and no bar-hole; the upper doorway has been built up and a small window has been formed in the infilling. 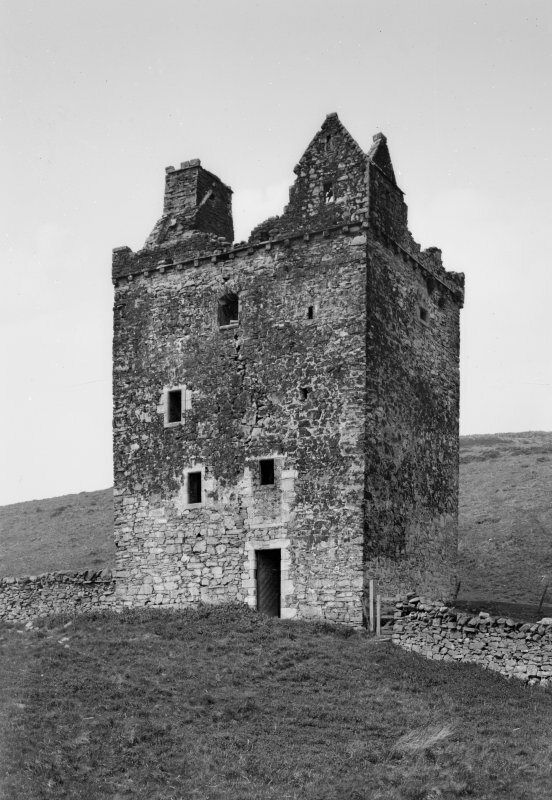 In 1543 Kirkhope was burnt by the Armstrongs, (Letters and papers, foreign and domestic, Henry VIII, xix, pt ii, 1544, No.33, 13) but the existing tower does not seem to be much earlier than 1600. 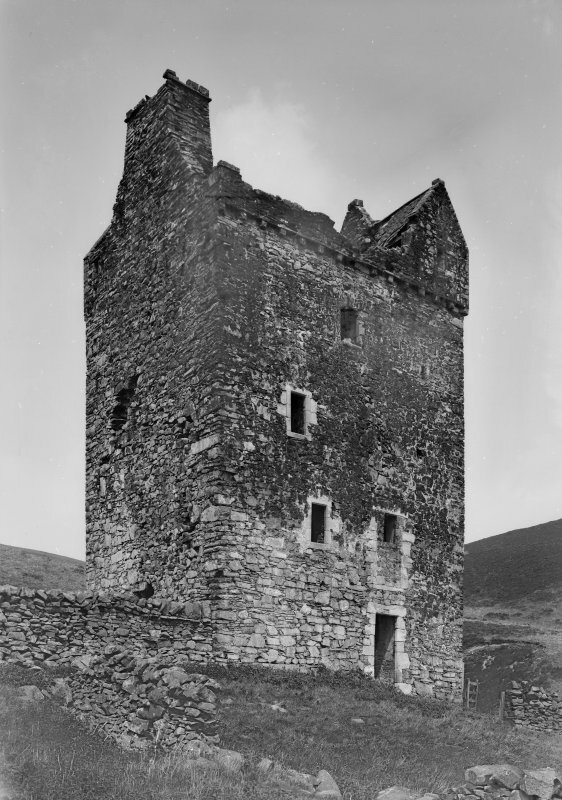 The tower is as described by RCAHMS. The outbuildings on the sides of the barmkin (which is of drystone masonry and contemporary with the outbuildings) are dealt with on NT32NE 7 as, contrary to the report by the Commission, they are on the outside of the barmkin wall and, together with the existing barmkin wall, later in date than the tower. 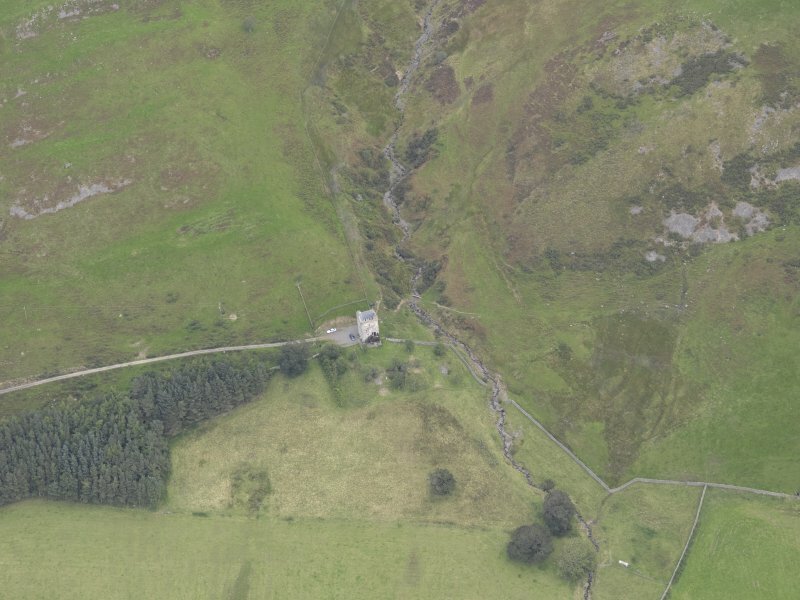 NT 3787 2505 A watching brief was conducted at Kirkhope Tower (NMRS NT32NE 6) by AOC (Scotland) Ltd on the excavation of a cable trench by Scottish Power. 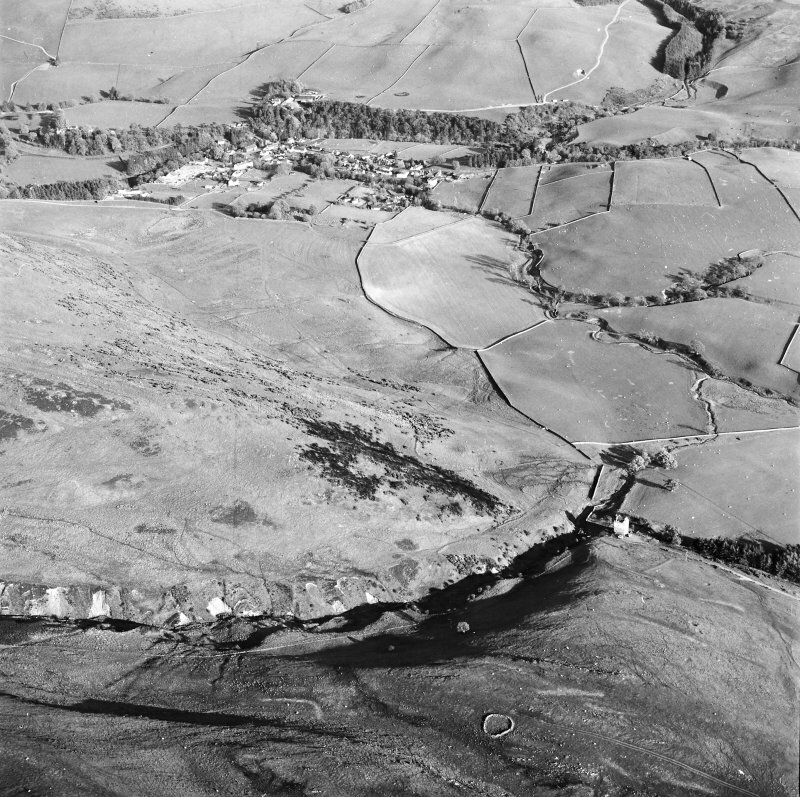 The trench was laid in the course of a programme of building and restoration works and extended from the NE angle of the tower, across the adjacent farm track, and along the N side of the track for a distance of c30m. This area had previosly been scarped by the creation of the farm track and no archaeological deposits were recorded. Four sherds of late medieval pottery were recovered from machine spoil. Kirkhope Tower is now roofed and occupied. Information from Mr D Scott, Bemersyde, 9 February 2001. Border Magazine, February 1899 - 1 photograph. NT 37784 25041 A programme of archaeological work was carried out, 27 August – 7 September 2012, to address questions about the building that were of interest to the owner. A desk-based assessment and review of the primary historical documentation for the site, was carried out by Richard Oram. 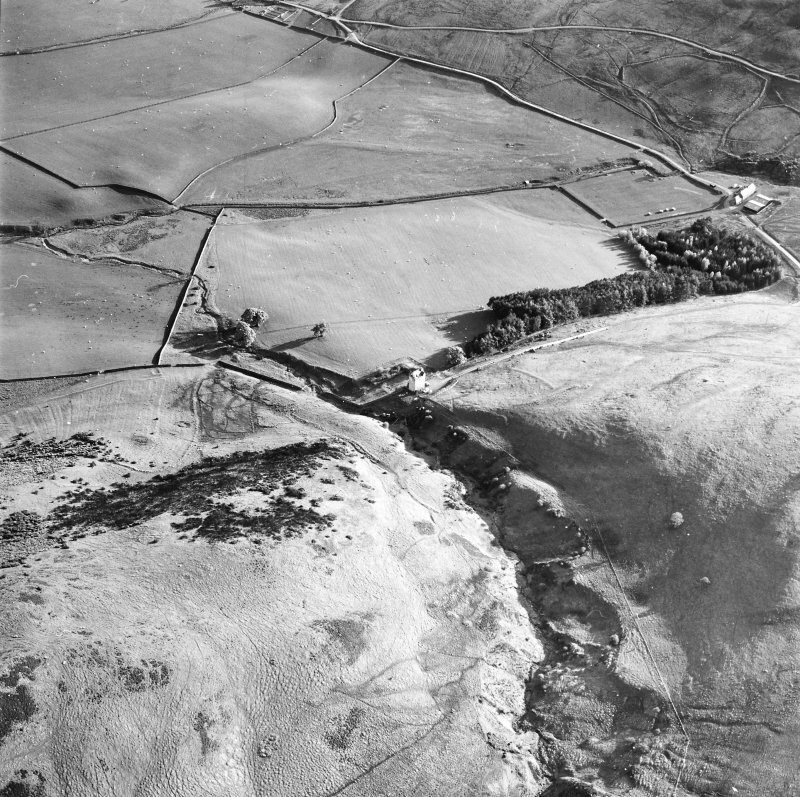 This research demonstrated that, although a building on the site is not alluded to until the sack of 1543, and not specifically mentioned until 1582, Kirkhope was clearly an economic unit of a much earlier date, part of the Douglas Lordship of Ettrick before coming under ownership of the Cranstouns. The Scotts of Harden, with whom the site is traditionally associated, are likely to have taken residence as tenants of the Cranstouns in the mid-16th century. 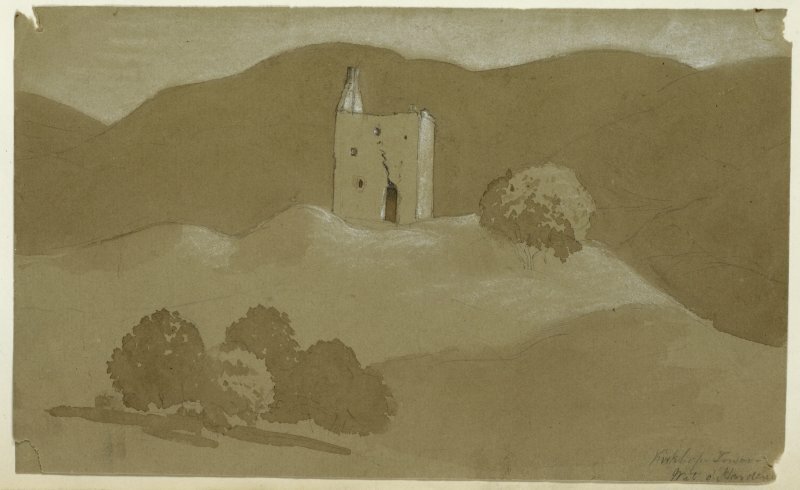 The site as a whole remained in occupation to the mid-17th century and it was only after that date that decline set in, though the tower itself had tenants into the 19th century as part of the Buccleuch Estate. Fieldwork included a general topographic survey of the environs of the tower. Ground investigation involved the excavation of seven evaluation trenches within the barmkin area, these positioned both to answer specific analytical questions about the site and to understand its state of preservation and stability. A trench placed on the E side of the barmkin failed to locate any evidence for an enclosing wall. Trenches within the S range provided important information as to its former arrangement. It was clear that there had been a vaulted lower storey and, perhaps, a hall at first floor level. Deposits within it may survive to a depth of up to 2m. The position of an entrance to the courtyard was confirmed, with one sandstone dressing, detailed with a broad chamfer, found in situ; the entrance had evidently led down into the cellar. A further trench confirmed the line of the E wall of the W range. The architectural survival of the site was shown to be significant with substantial clay and lime bonded walling surviving up to an estimated 2m high. The archaeological investigation revealed no evidence for a primary destruction event and almost no finds from the early period of occupation; however, because of the depth of overlying deposits floor levels were only reached in one of the trenches.